Ground Tarps and Track Belts are great ways to protect your spill containment berm investment by prolonging the berm's service life. These extra barrier layers provide additional protection to ensure your containment systems last a long time, even under tough operating conditions. 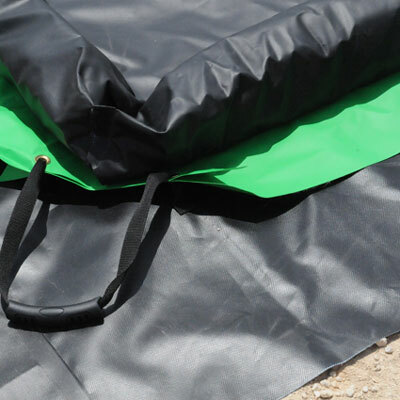 Position a Ground Tarp below your berm as a supplementary barrier to minimize the risk of punctures or rips on the containment system's floor area. For even greater tear resistance in gravel or rough surface environments, consider upgrading from our Standard liner to the Ground Tarp Plus. 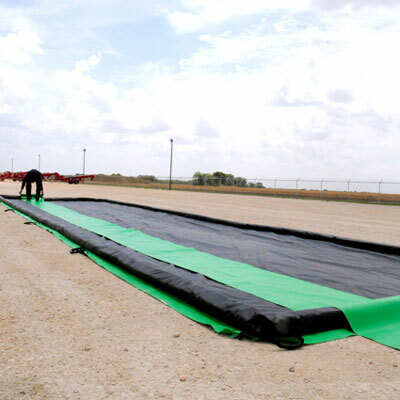 Its surface also has an absorbent top layer, making this unit ideal for oil field or equipment maintenance locations to ensure EPA and SPCC requirements are met. Track Belts offer a simple yet effective solution to protect containment berms that are subject to frequent truck or other heavy equipment traffic. The added material strips help prevent premature wear to the berm's surface layer from tire abrasion and punctures from debris on the ground below. Place belts so they lay inside and run the full length of the berm's floor area. Our berm accessories are made of durable materials like Polyester-blended PVC and Polypropylene for excellent oil and chemical resistance. They come in a selection of sizes and are compatible with all model containment berms, from our 72-foot drive-over units for trucks, to our economy models, and low profile secondary containment berms. 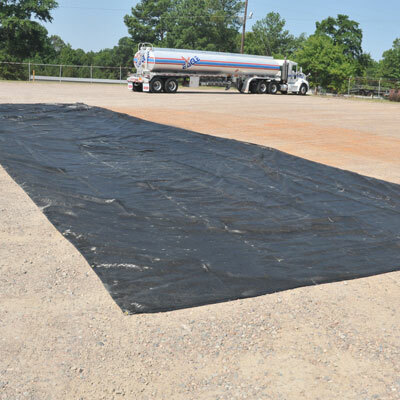 Our standard Ground Tarps are an easy to use, cost-effective solution to help preserve the lifespan of spill containment berms with all wall heights. They are compatible with any style of wall berm unit, including low profile, foam wall, and collapsible wall models. 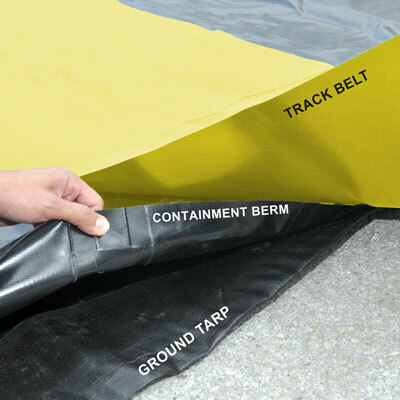 No assembly required: simply unroll and lay these tarps on the ground, under your berm, to protect the berm's floor from stone, twig and other debris punctures. The heavy-duty PVC and Polyester-blend material has an 18.5 oz per square yard weight and is suitable for temperatures up to -20°F. Our standard ground covering is an excellent choice for units of any containment capacity that house IBC, drums, machinery, or equipment. 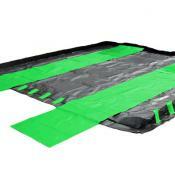 Select an appropriate size tarp by ensuring it overlaps the usable space dimensions of the containment berm. Typically, ground cover tarps measure at least 1 to 4 feet larger than the berm's footprint. Including the same benefits as the standard tarp, our dark gray Ground Tarp Plus provides even greater protection for any size berm. It offers 3 times stronger tear resistance and 5 times greater puncture resistance in comparison to standard 30-mil HDPE liners. This makes it an excellent ground cover option for spill containment berms in rough terrain locations with gravel, stones, sticks, and other sharp or loose materials. The plus model also has the additional feature of an absorbent top layer to capture leaks or spills up to 3.31 gal (water) or 3.42 gal (oil) per 100 square foot. Extremely useful for equipment maintenance or oil field locations where it's essential to preserve containment capacity and avoid environmental contamination. 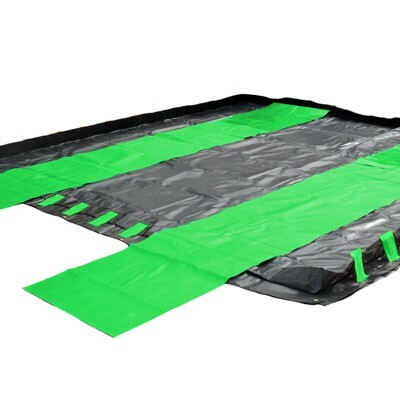 Made with 130 mil thick Polypropylene, this UV-resistant material won't stretch or crack and features a high-traction surface to reduce slip hazards. A versatile ground liner that easily welds for liquid-tight installation, it is even suitable for use as a secondary on-site containment structure for tanks and drill cuttings. Track Belts are the ultra containment berm accessory for drive in/drive out units that service large trucks and other heavy vehicles or machinery. These wide sections of material act as heavy duty buffer strips to protect the berm floor from vehicle tire wear, pressure, and movement. Constructed from robust 18 oz blended PVC layers, this material ensures low stretch as well as excellent hydrocarbon resistance. Sold in pairs, these 30" wide green tracks normally span the full length of the berm where a vehicle’s tires traverse. 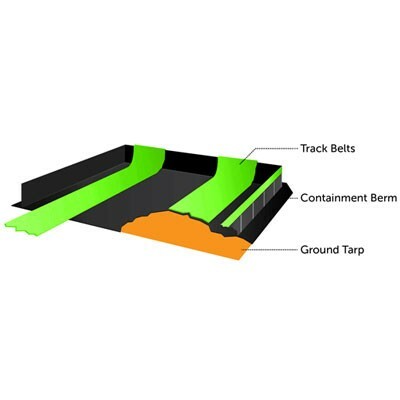 For secondary containment models with foam walls or other styles of collapsible wall, it is helpful to overlap belts beyond the usable space to cross the wall berms. Therefore, you may need to order a few extra feet of length to provide sufficient coverage and protection for the berm. Suitable for all types of wheel traffic, these matte belts provide good tear resistance, traction, and adhesion. This makes them perfect for even wet conditions, or, if the berm shifts during the movement of vehicles or stored materials. Standard Ground Tarp: Matte-finish black Polyester-blended PVC. Anti-Mildew and UV Pigment treatments.18.5 ounce/square yard. 100 x 1300 Denier. Suitable in up to -20°F operating temperatures. Ground Tarp Plus: Dark gray Polypropylene comprising three barrier films sandwiched by two layers of needle-punched geotextile with heat-fused surfaces. UV Resistant. 130 mil thick. Top side absorbency: Water = 3.31 gal./100 sq. ft.; Oil = 3.42 gal./100 sq. ft.
Track Belts: 30" wide matte-finish green Polyester-blended PVC. Anti-Mildew and UV Pigment treatments.18.5 ounce/square yard. 100 x 1300 denier. 375 x 375 lbs./inch grab tensile. 26 lbs./2” adhesion. 100 x 100 lbs. tongue tear. Suitable in up to -20°F operating temperatures. 40 CFR 122.26 and 40 CFR 112.7. Berm accessories help comply with EPA Container Storage Regulations and meets SPCC requirements. 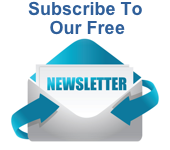 Feel free to contact us by email or call toll free (800) 869-9633 for any questions about spill berm ground tarps and track belts, or custom size order and shipping information. We are also happy to help with inquiries about spill containment solutions and other model containment berm options. Dimensions: 11 feet wide x 11 feet long. Material: Polyester Blended PVC. Color: Black. For all 4 feet x 6 feet, 6 feet x 6 feet and 10 feet x 10 feet berms. Weight: 8 lbs. Dimensions: 16 feet wide x 64 feet long. Material: Polyester Blended PVC. Color: Black. For all 12 feet x 60 feet feet berms. Weight: 67 lbs. Dimensions: 19 feet wide x 54 feet long. Material: Polyester Blended PVC. Color: Black. For all 15 feet x 50 feet berms. Weight: 68 lbs. Dimensions: 19 feet wide x 70 feet long. Material: Polyester Blended PVC. Color: Black. For all 15 feet x 66 feet berms. Weight: 88 lbs. Dimensions: 12 feet wide x 22 feet long. Material: Polypropylene 130 mil. Color: Dark Gray. Weight: 54 lbs. Dimensions: 12 feet wide x 32 feet long. Material: Polypropylene 130 mil. Color: Dark Gray. Weight: 79 lbs. Dimensions: 12 feet wide x 52 feet long. Material: Polypropylene 130 mil. Color: Dark Gray. Weight: 129 lbs. Dimensions: 12 feet wide x 62 . Material: Polypropylene 130 mil. Color: Dark Gray. Weight: 153 lbs. Dimensions: 12 feet wide x 450 feet long. Material: Polypropylene 130 mil. Color: Dark Gray. Weight: 1130 lbs. Dimensions: 30 inches wide x 56 feet long. Material: PVC 18 ounce. Color: Green. Set of two (2) per case. Weight: 144 lbs. Dimensions: 30 inches wide x 66 feet long. Material: PVC 18 ounce. Color: Green. Set of two (2) per case. Weight: 173 lbs. Dimensions: 30 inches wide x 72 feet long. Material: PVC 18 ounce. Color: Green. Set of two (2) per case. Weight: 190 lbs.